Last night James and I had our first night out in France without kids. 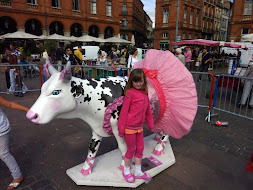 We had organised a babysitter through a great facebook site for expats in Toulouse. James had been offered tickets to the opening of the art exhibition "airbus through the eyes of Tony Soulie". It was part of the arts festival and quite a big event. We arrived and were greeted with Champagne and nibbles and then wandered around the exhibition looking at photos of planes. We got our free poster and got the artist to sign it and then wandered back to the car. 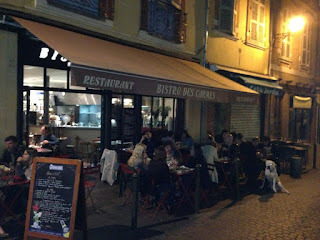 We had decided to go out for dinner after the exhbition but discovered that the area where the gallery was was not that nice and so got back in the car and drove to the centre of Toulouse 5 minutes away. 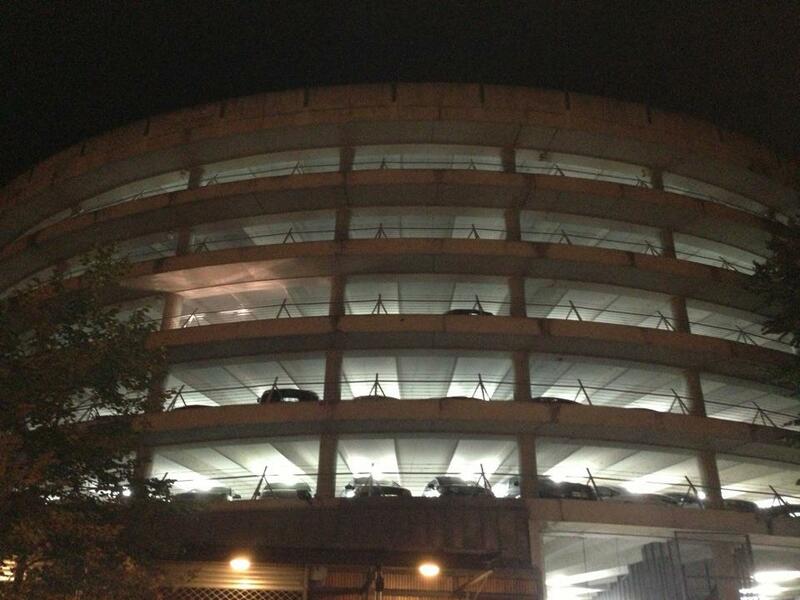 We parked in a very cool car park that was just a spiral that went higher and higher with very tiny parks. 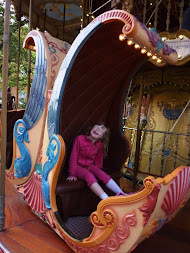 When we came to park our 7 seater we discovered why some cars had taken up two parks. Car parks in Toulouse are generally fairly small but these were narrow and short and angled so needless to say even though James parked perfectly we still took up two parks! We walked down the stairs and came out onto this very busy, bustling street crammed with cafes and bars. James thought he knew of a square we were near so we headed for that. After walking past numerous delicious looking cafes we found a town map and got chatting to a lovely French guy who said the square we were heading for was a bit of a walk and suggested we go back to the street we had just walked down. We turned around and found a lovely cafe right outside the car parking building! 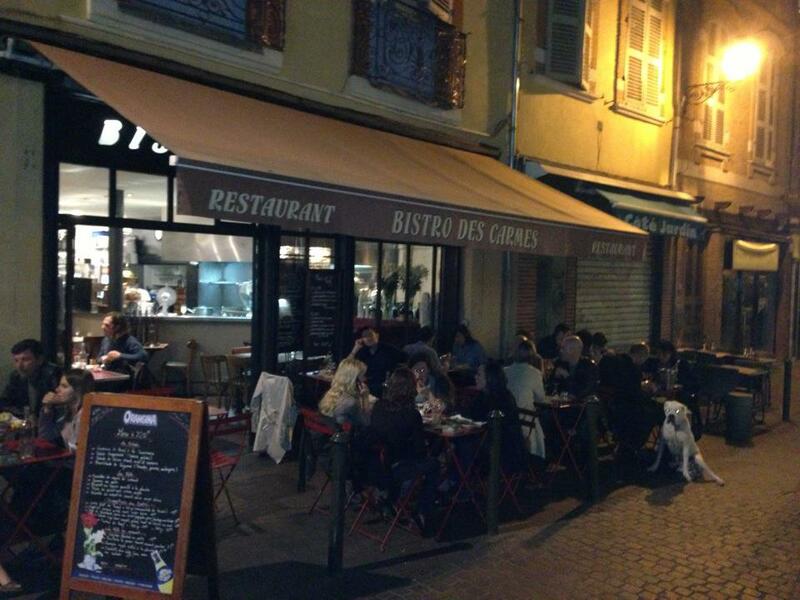 Everyone eats very late in France so finding food at 9.30pm was not a problem. The cafe was very French, straight out of a movie and the waitress spoke great English, but when she found out we were living here she said that next time I go back I need to be able to order my meal in French - so that's a good challenge. 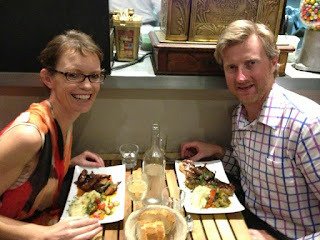 The food was beautiful, I got the Southern France speciality which is duck and James had a steak (the best so far in France). A lovely evening out. We decided that we would just have a quiet day today, so spent the morning chatting to people back home via the telephone and skype. After lunch we headed for a local forest for a walk. It apparently has lots of good mountain bike tracks in it so I think James was wanting to check them out for when he gets his bike in five weeks. The walk was pretty boring really and we headed back to the car feeling a bit dissappointed and then we saw a sign to a lake so decided to take a look. Even though the lake was not for swimming it was still a lovely little spot, and we walked right around the lake and walked back to the car feeling like we had had a successful outing after all. We then had a bit of a drive around some local villages went to the supermarket and headed home. James has gone out to the rugby tonight. A work colleague from New Zealand is travelling around France with his wife and has been in Toulouse. James got tickets for the rugby from work so has taken them with him, which should be fun. It is raining so I am very happy to be at home. Our other news is that we have found a lovely lady to be Hannah's teacher aide. She is a mum who is looking to get back into the workforce and is keen on education. She seems very suitable so fingers crossed that the school now accepts Hannah's application and she can start as soon as possible. Hannah will just do mornings to start as the school wants a full time teacher aide which would be too expensive plus we think it is unnecessary as Hannah has never had full time support. Once she starts hopefully the school will see how good she is and we will be able to extend her hours. Hannah enjoys the homeschooling and is such a hard wee worker but she misses Jasper and Penelope terribly and is quite lonely. I am getting a car (yes it's just little) next week so hopefully that will help as her and I will be able to go out on adventures together. Toulouse is a city where you need a car as the public transport system is quite poor. It is a bit like Auckland where everyone drives everywhere and there is heaps of traffic. We have recently installed BBC TV onto our computer so we can watch English TV so I might check out what's on tonight. The screen is very small but better then watching tele in French. Your evening out sounds great! Loving the photos. How's the French speaking going? I'm impressed you're getting your own car - I'm sure you'll be whizzing about in no time.